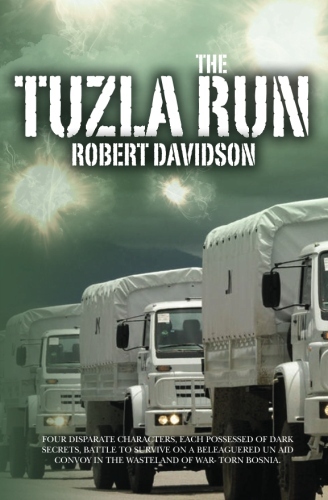 An uneasy truce between IRA assassin Declan Rath and ex SAS soldier ‘Spider’ Webb adds to the spiralling tension as a Tuzla-bound convoy battles through war-torn Bosnia to bring aid to the beleaguered city. Targeted for destruction by Croatian Military Intelligence and Serbian para-militaries, the convoy, unwitting carrier of smuggled arms, is prey to all sides. The action explodes against the ravaged Balkan terrain where conflict is inflamed by the hatred of centuries. The inhospitable landscape provides its own challenges to men who, facing attack from artillery and snipers, must also confront the private fears that caused them to join the Tuzla Run. The treacherous mountain tracks and raging river torrents combine in a roller coaster ride which tests even the most experienced drivers amongst those brave and foolhardy enough to join the UN relief convoys.